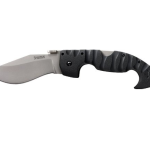 Elegant, efficient, and reliable, the Buck 110 Folding Knife is a must-have for any serious outdoorsman. Buck 110’s have long been the go-to knife for hunters for field dressing in particular, allowing even beginners to quickly learn how to prepare a carcass. This classically handsome blade is built to last through heavy use and extreme conditions, even coming with a forever warranty to prove it! Buy a Buck 110 on Amazon! For every model, the standard 3 3/4 inch stainless steel folding blade allows for both fine detail work and more laborious and concentrated efforts. Though more difficult to sharpen, stainless steel retains its edge with ease use after use and can be finely resharpened with a little care and patience, saving time in the end. While other blades may use cheap or imperfect steel, Buck’s commitment to quality means every 110 is made of 420HC stainless steel to ensure it suits your needs. For classic models, the handle has a pleasant weight to it, offering a more secure feeling grip as it balances into your movements to offer further precision, while EcoLite models feel more like a standard tactical knife and offer a more scratch resistant and durable handle. All Buck 110 knives feature handles that are just the right size for a comfortable and ergonomic grip. The hinges are built to be just as tough as the rest of the knife and allow for graceful opening and closing. 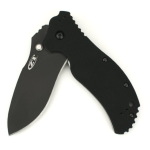 With a sturdy and reliable locking mechanism, the knife is safe to carry but still easy to access as needed. Modern models consist of the classic Folding Hunter, a finger grooved version, EcoLite paperstone models, and the gorgeous “Rising Wisdom” model by David Yellowhorse. 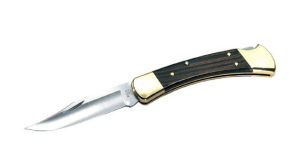 The classic Folding Hunter features a sumptuous curved wood handle with brass caps and screws. With the original design dating back to 1962, this knife is a perfect example of, ‘if it ain’t broken, don’t fix it.’ This blade is actually featured in Buck’s Chairman Knives series, and the Chairman version comes with a Cherry Dymondwood handle, Nickel screws, a genuine Buck medallion, and Chuck Buck’s signature on the handle as a testament to its quality. If you need a little more grip action, the Folding Hunter Finger Grooved model’s carefully crafted grooves encourage the knife to settle into your hand like nothing else, becoming more an extension of oneself rather than a hunting knife. It features the same classic wood and brass handle, and both weigh a pleasantly weighty 7.2 ounces. The EcoLite model, available in a rich forest green and warm cedar red, is half the weight of its classic cousin at only 4.1 ounces. The key to the new extreme weight reduction while maintaining and even improving durability comes from the use of sustainable post consumer material to form Paperstone. Made from resin and dense paper fibers that have been mixed in sheets and compressed with extreme heat and pressure, it is uniquely earth friendly and uncommonly strong. Renowned for its rugged good looks, strength, and resistance to heat and cold, the paperstone handle of the EcoLite allows users to have the same good looks, ease of use, and toughness as the original model with the option of a less weighty handle. For a truly breathtaking pocket knife, however, Rising Wisdom is second to none. David Yellowhorse’s expertise and design skill have made this knife a must have. This limited edition pocket knife has the same impressive mechanisms and durable blade as other models but features a unique handle that could complement any true gentleman. Made of nickel silver with ruggedly elegant pressed designs on either end, this knife would be breathtaking even without the inlay of deep Jet, orange Siny oyster, and turquoise in a native-inspired design. With both the handle and blade polished to a mirror shine, this heavy 7.6 ounce knife is stable and perfect for dedicated outdoorsmen. Sized just right, made of strong materials, and designed by a company known for continuously seeking user feedback to improve, this blade has had over 50 years to be worked and reworked to be exactly what a folding hunting knife should be. No hunter should be without the classic and ergonomic reliability offered by Buck 110 Pocket Knives. 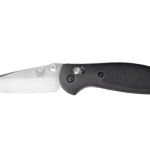 Buy a Buck 110 Online Now from Amazon with a Steep Discount!